The town of Monforte d’Alba leans against, as one can deduce from Latin – Mons Fortis, a rather steep hill, and it’s the last rocky buttress of the Langa in Barolo. Here, we can find several renowned wineries and some excellent restaurants. The weekly market takes place every Monday morning in the small Piazza Monsignor dell’Orto, which is opposite the Town Hall and the Chiesa della Madonna della Neve. It’s a meeting place for the villagers and it has 16 stands including 13 stable ones. Some of them are reserved for stands that belong to farmers and seasonal products vendors. The market’s small size and the limited flow of buyers, who don’t always crowd the stalls, will allow you to exchange a few words with the vendors. At the cheese stand we find Franziska from Switzerland, who for 25 years now has been producing toma cheese in the traditional Langa way. “Here the cheeses are made like they were once made on the farms,” she says. Franziska runs a small farm in Sinio along with her children, and deals first hand with every aspect of the cheese-making process: from taking care of the animals to production. 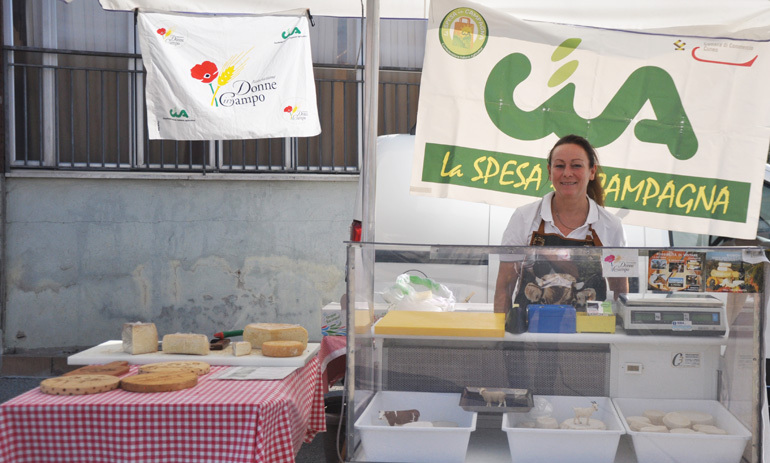 While she prepares small samples of cheese (cow, sheep and goat toma) and places them on display for the public, she tells us that her stand can be found in some of the numerous markets in the Langhe and Roero area: Dogliani, Canale, Valle Talloria, Montelupo. At the center of the square we meet Mr. Romano from Tarantasca; he’s a street fish vendor who has been selling fish in the markets throughout the province of Cuneo for over thirty years now. 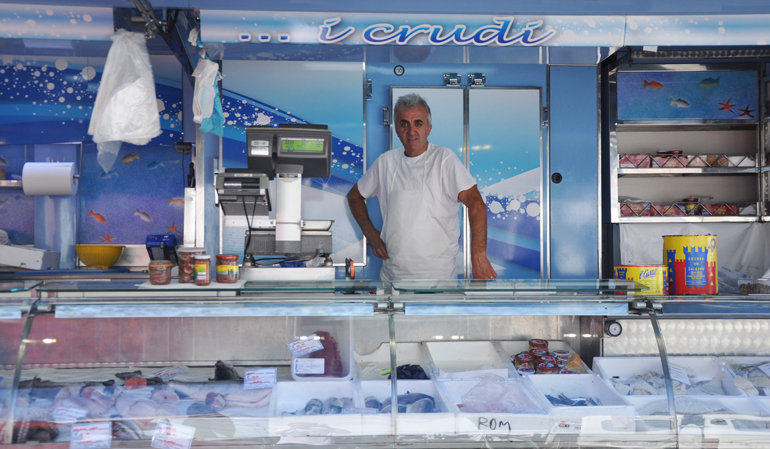 On display we can find every type of fish, both Italian and foreign, fresh, frozen and preserved. Upon request, Mr. Romano will prepare it on site. Special fish and fish that isn’t readily available can be ordered. Equally rich is Mr Roberto’s bakery products stand. Mr. Roberto, who is from Roddino, offers several kinds of bread all of which are prepared with mother yeast and various types of stone ground flour from local producers, some of which are, sadly, disappearing. His stand is full of delicacies: focacce and pizzas, panuvetta made from sourdough with malt, pancioccolato and tarts. There’s also a small seasonal fruit and vegetables stand, a well-stocked street grocery vendor who sells meat, cold cuts, sausages and local produce and a few clothing and accessories stands. The Monforte d’Alba market is small in comparison to other markets in the area, but it is quite well stocked with regards to food products. Tourists and aficionados alike can visit the la Morra market, which is similar both in size and number of stands, from 8 a.m. to 1 p.m..